The game had two concurrent releases: EGA and VGA. See: Version differences. Game brochures ("feelies") are used for copy protection. 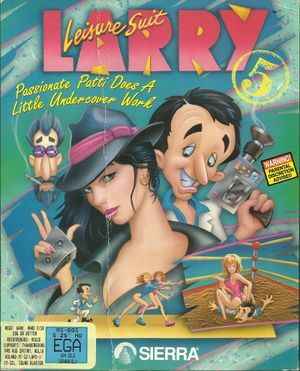 Only the VGA release is included in the Leisure Suit Larry bundle, comprising Leisure Suit Larry 1 - 6. For details see: Version differences. Pre-packaged with ScummVM 1.8.0. 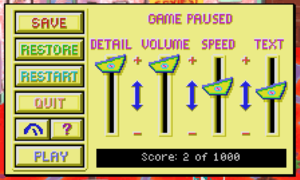 The "EGA" version runs in 16 colors, while the "VGA" version in 256. Both releases employ SCI engine and have an icon-based point-and-click interface. The GOG.com re-release uses ScummVM configuration file lsl5.ini. The GOG.com re-release includes a pdf manual, however the codes are virtually impossible to decipher, due to poor quality of the scan. ↑ 2.0 2.1 File/folder structure within this directory reflects the path(s) listed for Windows and/or Steam game data (use Wine regedit to access Windows registry paths). Games with Steam Cloud support may store data in ~/.steam/steam/userdata/<user-id>/765860/ in addition to or instead of this directory. The app ID (765860) may differ in some cases. Treat backslashes as forward slashes. See the glossary page for details.